I’ve come to really, really love the spigarello broccoli leaf we started growing this year. It’s sweet, tender, and has great flavor. It works just as well lightly cooked as it does raw, such as in this fresh salad. This is a wonderful (and very easy to make!) late summer/autumn dish, perfect as apples come into season. Wash greens thoroughly and tear the leaves off the thicker center stems. 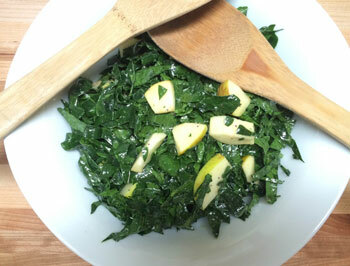 Cut the tender leaves into ribbons and throw in the bowl with your dressing. Core apple and cut into chunks, and add to bowl. Toss ingredients with dressing thoroughly, and serve. Other additions work really well in this salad, too, such as chopped nuts and blueberries. Enjoy!